When my wife and I got married, I was finishing up graduate school and our “honeymoon” consisted of driving a car and a pickup truck pulling a U-Haul trailer from Montana to Vermont in 3 days. So, after 25 years, it was time to take a real vacation and the honeymoon we never had. While I’ve traveled all over the world with work, Diana had never been out of North America and we’ve never really traveled without kids. 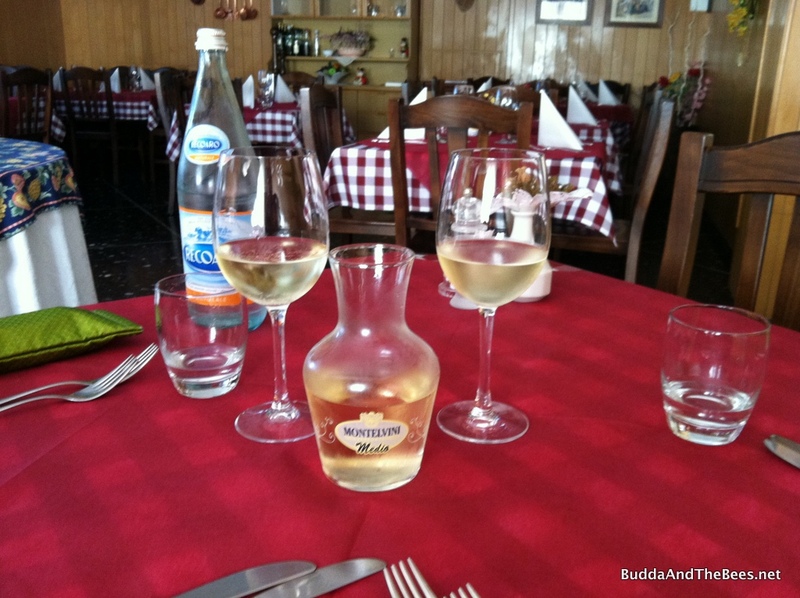 We chose northeastern Italy since I had been there recently and we both love Italian food, wine and culture. While I was researching places to see, a couple of my favorite top bar beekeeping sites posted items on bees in Greece and Croatia which made me wonder if there was any bee related things we could see on our trip. After all, a honey-moon wouldn’t be complete without some honey-bee sightseeing! So, I took to the Google and started searching for bee-related stuff around Trieste where we would be staying for part of the trip. 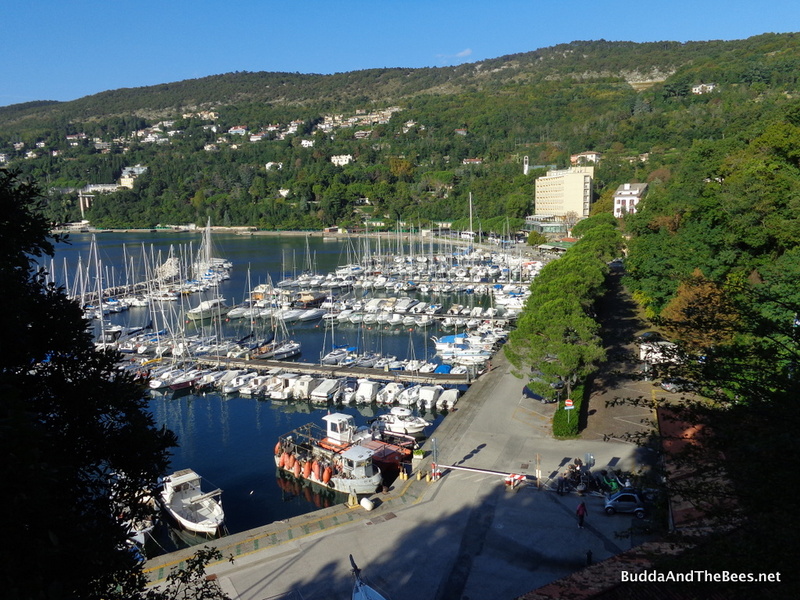 Trieste is a marvelous place that few westerners visit (try finding anything about it in the popular travel guides) and is right next to Slovenia. It’s home to the International Center for Theoretical Physics (ICTP) where I taught some workshops a few years ago. I came across a wonderful page on Solvenian beekeeping and found that Slovenia is the home of the Carniolan honeybee (Apis mellifera carnica) which is the type of bee I have in BnB1! 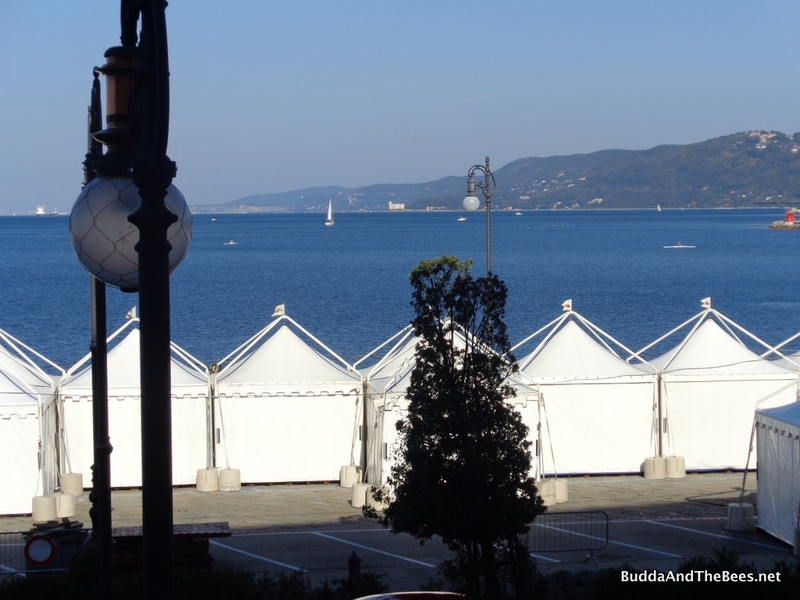 As I looked into the recommended places listed on the web page, it turned out that a couple of them were within driving distance of Trieste. Now all I had to do was convince Diana that this was a necessary diversion. A friend of hers had recently visited Slovenia and mentioned the Lake Bled area which is near the places I wanted to visit (about 1.5 hours from Trieste) so that made the sell a little easier. In the end, she was into the whole bee thing, so we planned for a day of bee sightseeing in Slovenia. The first place we visited was the Slovenian Beekeeping Centre at Brdo pri Lukovici, outside of the capital city of Ljubljana where the world beekeeping congress, Apimondia, was held in 2003. I tried contacting the center before traveling to get a tour, but was late doing that and didn’t hear back from them, but we decided to visit anyway. The Slovenian Beekeepers Association is well organized and has the support of the government, unlike in this country where the EPA seems to actively work against the beekeepers. Beekeeping is big business in Slovenia – they can only keep Carniolan bees and have strict standards on queen rearing and honey production. Our first stop at the Beekeeping Center was the gift shop which sells beekeeping equipment in addition to novelty beekeeping items. We had a great conversation with the woman who worked there. She keeps 20 hives on a few acres and told us that this had been a hard year for beekeeping. They had lots of wet weather during the summer and not much honey production and are also having a high mite load this year. She was worried about the upcoming winter and whether her bees will make it. We sampled the different flavors of honey and bought some to bring back with us. 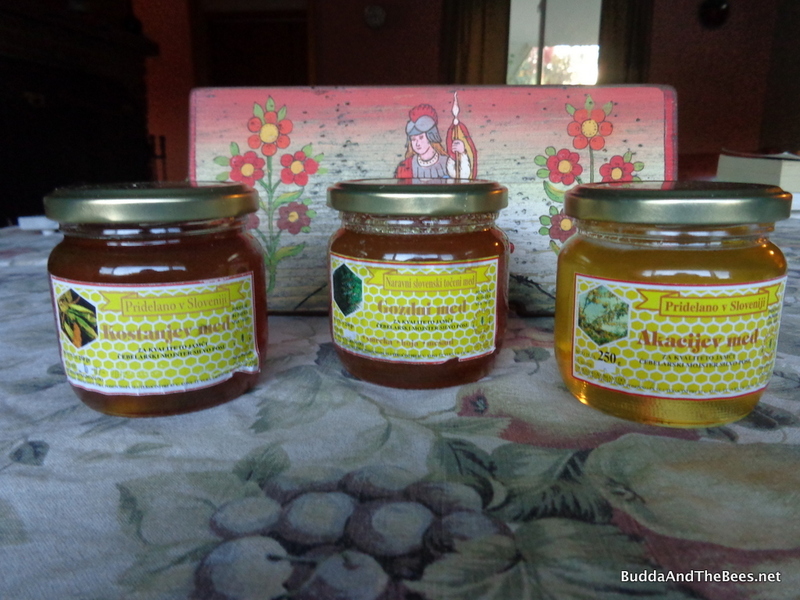 There are several types of Slovenian honey (med) that are designated by the types of plants from which the bees collect the nectar or sugary sap. One of the popular ones is Linden honey (Lipov Med) from Linden trees, which Diana really liked (the large jar we brought back last week is half gone already). I just planted a Linden tree in my yard this year and the bees love the ones in the neighborhood. Others include black locust, chestnut, spruce and fir honeys. The latter is collected from the honeydew on fir trees. When the bees collect nectar and honeydew from variety of plants, the honey is labeled flower or forest honey. Next we went upstairs to the Slovenian Beekeepers Association headquarters. Since we showed up unannounced, they really didn’t have a tour for us, but we talked for a while with a woman named Tanja who gave us some literature about Slovenian beekeeping and the Carniolan bees. After that, we decided to eat at the restaurant back down on the first floor, but when we sat down, we realized we couldn’t read the menu since it was all in Slovene which has lots of consonants and very few vowels. Fortunately, Tonja and another woman came down to eat their lunch so we asked for help with the menu. They invited us to eat with them and as the time went on, other members joined us including the president of the association. It was a great way to get to know some of the local beekeepers and talk about bees and family life. The cafe overlooks a beautiful valley that reminded us of Vermont. On the grounds of the Beekeeping Center, there is a path which you can walk for a self guided tour with some signs about bees and beekeeping. 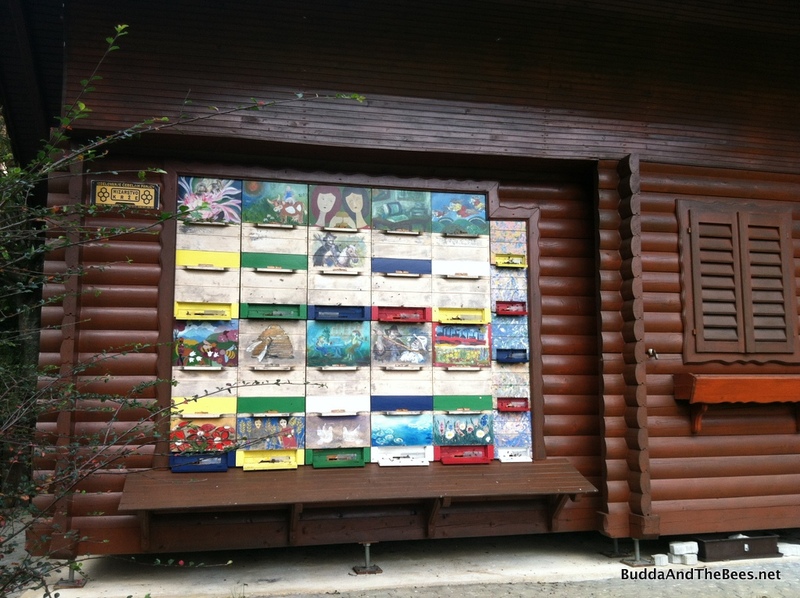 There are two Slovenian bee houses on site. Many beekeepers still use these types of houses for their bees (Tonja said she has some of her hives in them). While some beekeepers now use Langstroth hives, the traditional Slovenian (AZ) hive is a bit different. Usually, it consists of a brood box and one super for honey (sometimes 2) and was designed to be easy to carry on your back as you trudged up the mountainside. These hives are placed together in a bee house which protects the hives from the weather and allows the beekeeper to work inside, accessing the hives from the back. They also place hives on a truck for mobile pollinating services. In the mid-18th century, beekeepers started painting folk art on the front of the hives, depicting historical events, biblical stories and everyday life. While this isn’t as popular as it once was, some beekeepers still paint the fronts of their hives. It’s said that the painted hive fronts help the bees find their particular hive more easily and it’s also a way for the beekeeper to keep track of each hive (for example, which has swarmed). 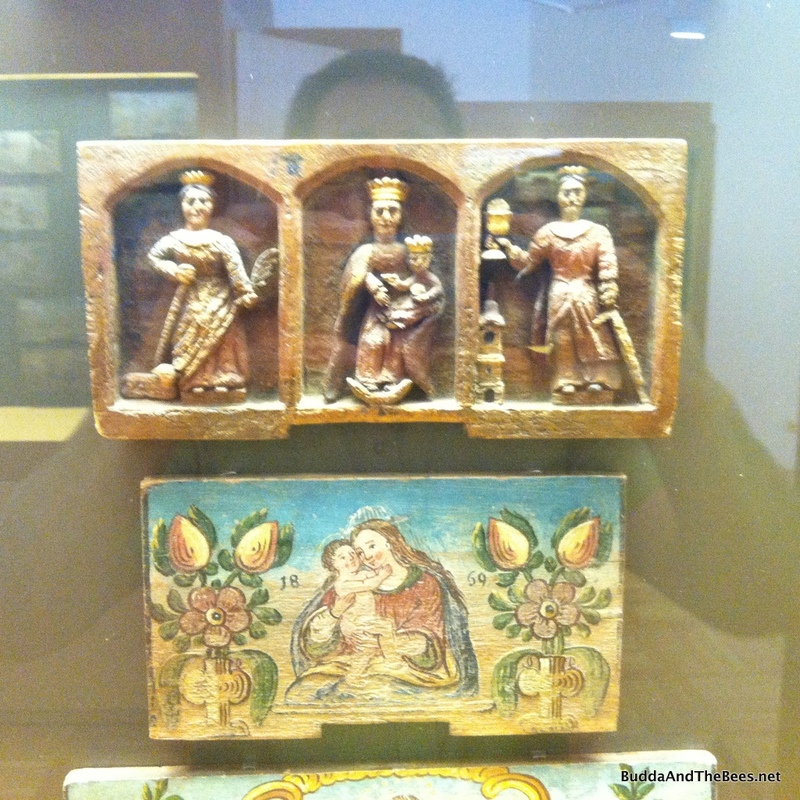 I was impressed with the variety and details of the paintings – they put my little flowers to shame. I brought back a reproduction of a hive painting to put in my bee yard. 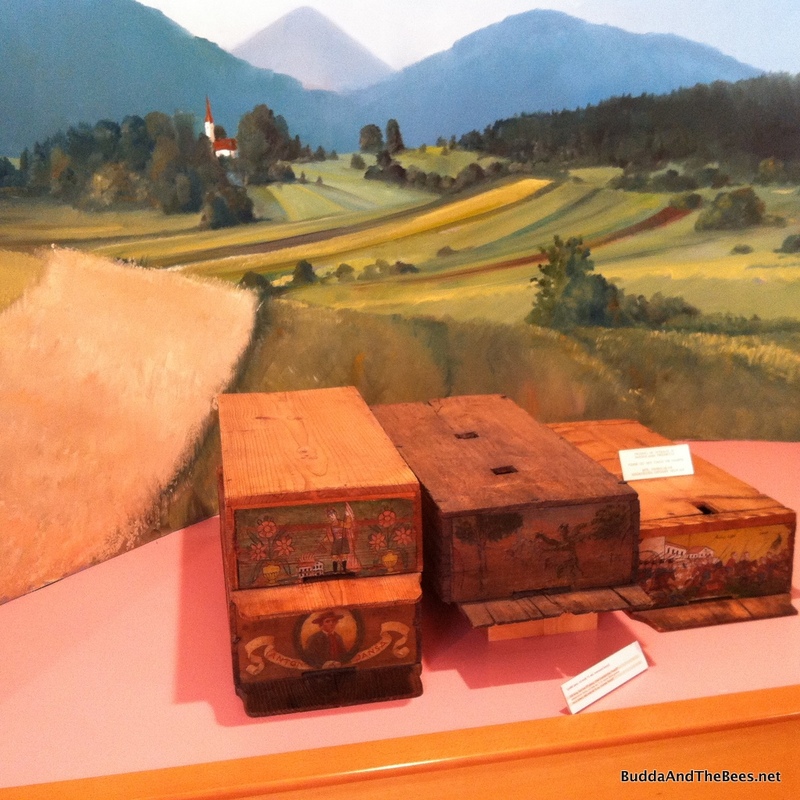 Our next stop was the Museum of Apiculture in Radovljica which has a great collection of old painted beehive panels and Slovenian beekeeping history. The museum is located in the Baroque Mansion House in the old part of the town and was a little difficult to find – mostly because I wouldn’t stop to ask for directions. 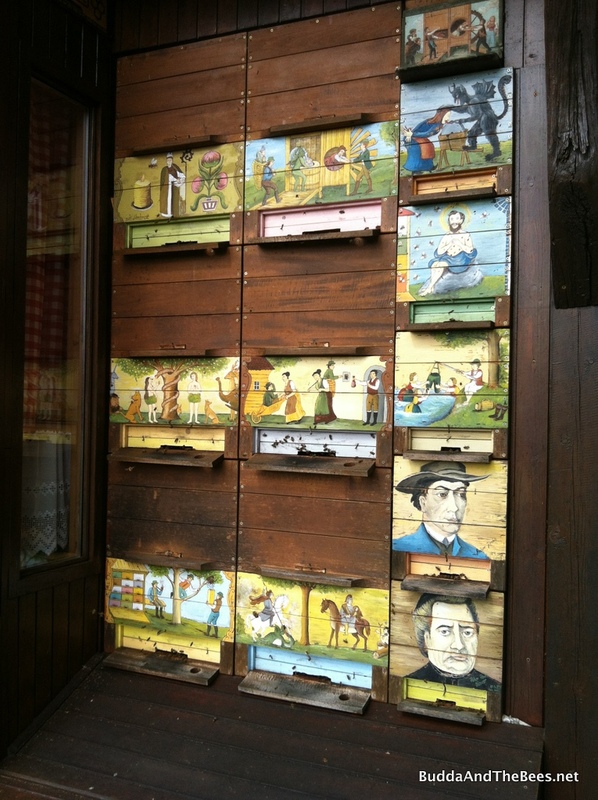 Slovenia has some famous beekeepers known for their teachings and writings on beekeeping. Anton Janša (1734–1773) was recruited by the Empress Maria Theresa of Austria to be a teacher at the first Beekeeping School in Vienna and wrote a couple of books on beekeeping and bee biology. 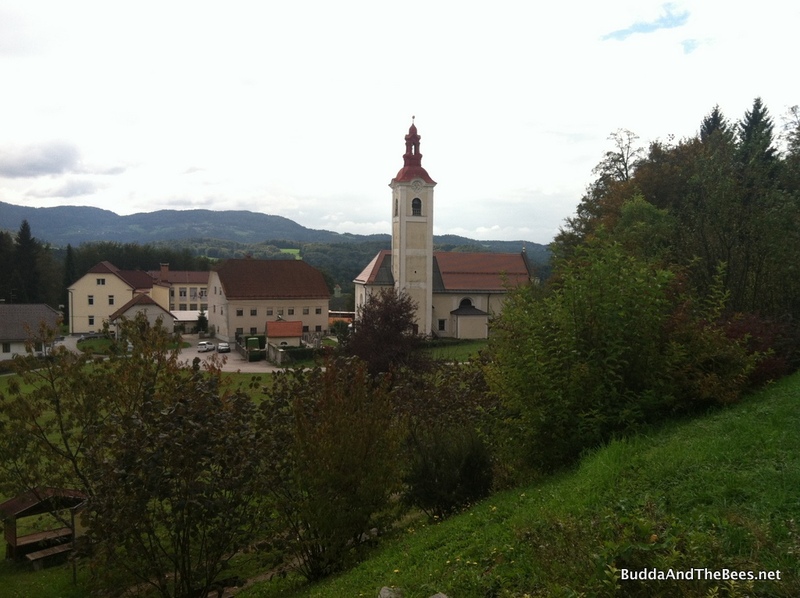 Peter Pavel Glavar (1721–1784) was a priest who wrote the first Slovenian beekeeping text. The museum has an observation hive which I spent a lot of time at looking for the queen, but never found her. The attendant told me she’s shy and hard to find. After the museum, we drove to Bled but since it was getting late and we had to return the rental car in Trieste that evening, we only had a brief time to drive around the lake and take some pictures. I definitely would like to return to stay in Bled and explore other beekeeping sites in Slovenia. The Slovenian Beekeepers Association promotes beekeeping tourism and there are several beekeeping routes you can take to the different regions – each highlighting a different type of honey and history. I think I’d have to take that trip alone or with another beekeeper. My wife likes bees, but she’s not so geeky that she’d spend a whole vacation looking at them. But I would. Follow these links for more pictures of Slovenia and Trieste. Congratulations on your 25th anniversary! Wishing you many more happy, healthy, and creative years together! You know I have a weakness for painted hives, and those are just spectacular. Love, love, love! The website now has the next two trips itineraries posted on the website. We still have room on the Sept 27-10 Oct, 2015. We are now also importing the Slovene AZ hive boxes. For more info, email me. 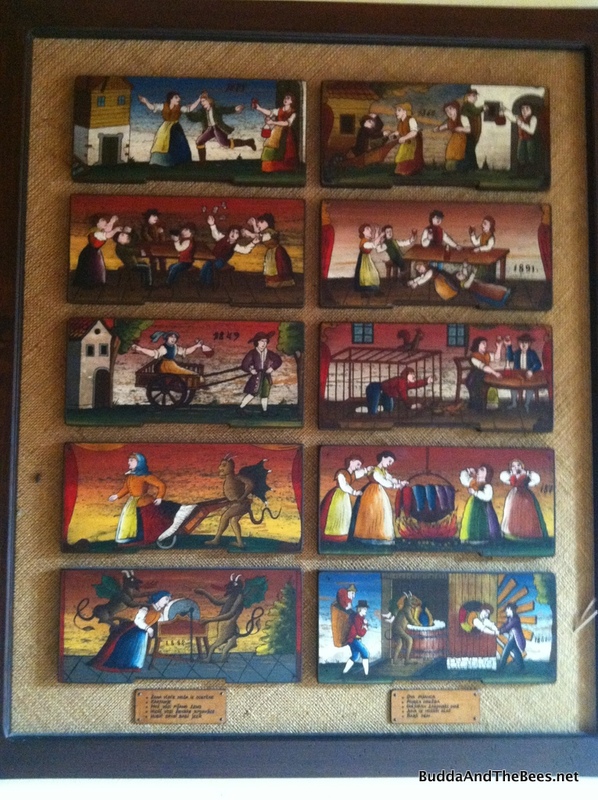 Do you know where I can purchase a replica of the old Slovenian painted beehive panels? What is “the Slovene AZ hive boxes”? Are you doing any beekeeping tours in 2016? I got my replica in Slovenia, but don’t know where you can purchase them in the US. Perhaps you could e-mail Suzanne at the address above about beekeeping tours and beehive panels. Hi! I’m a beekeeper from Slovenia and reading this blog post has been part hilarious and part fascinating. It is so interesting to read about our beekeeping from a foreign perspective, since we grew up with it and our hives and bee houses are nothing special to us. But it seems that Slovenia is becoming an IT destination for beegeeks such as yourself and personnally, I think that is pretty great. If you had more than one day (or if you intend to come here again), there’s still a lot of beekeeping related sights you could have seen, but nothing beats visiting an actual beekeeper. 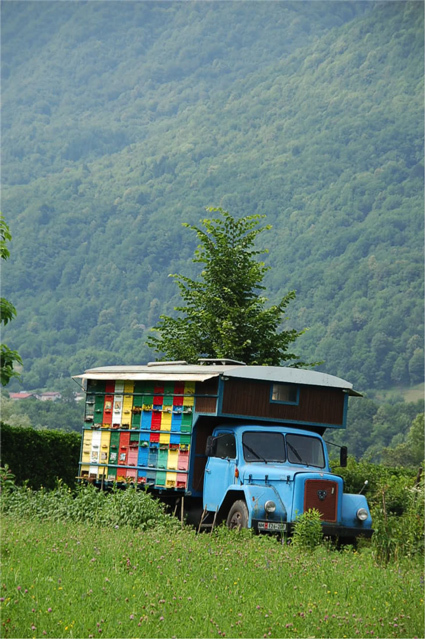 Some of them have little beehouses converted into apitheraphy and savna wellness centres, some of them could show you our “trusted” bee transportation trucks (some dating from the 60s) that we still (mostly) adore. 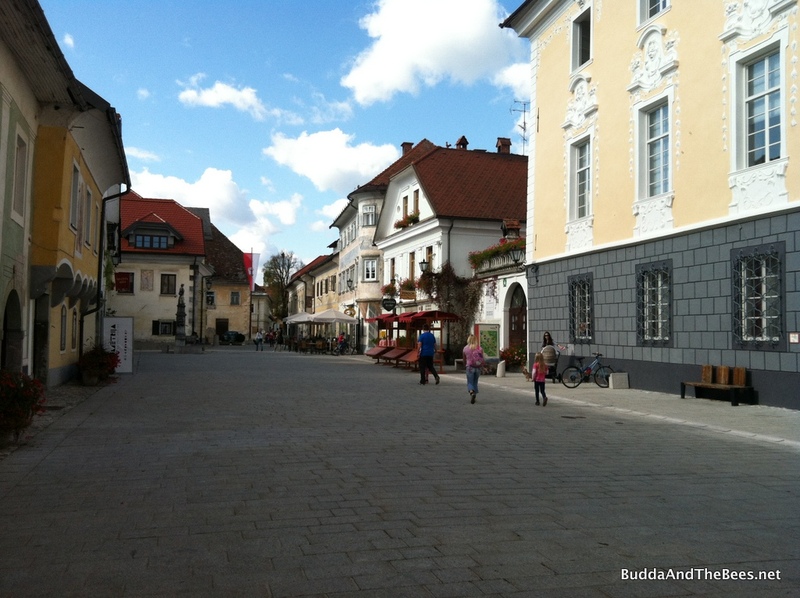 The museum in Radovljica is a must (a shame you couldn’t visit Bled more thoroughly, though) and even though I’d probably skip Lukovica, that lunch with our president was a score. Though I think the lady you’ve talked to is Tanja (not Tonja) and is still working there. Hi Eva, I’m glad you stumbled across my post. I did love my short time there and hope to go back some day. Your suggestions are great. 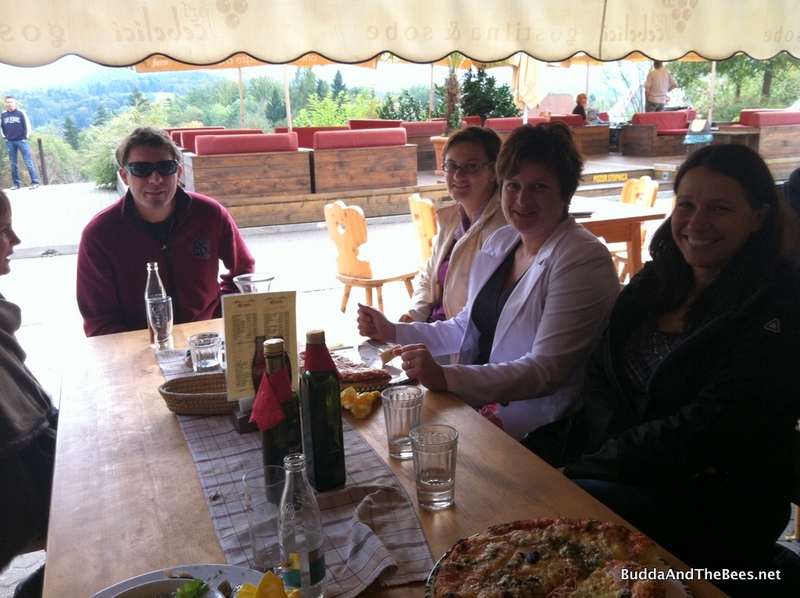 One of the other commenters (Suzanne) leads tours to Slovenia where they do get out to visit several beekeepers. She also sells AZ hives and equipment. I hope to have my own AZ bee house in Colorado one day. Thanks for the correction on Tanja’s name, I’ve fixed in in the main post.